"Substantial uncertainty" surrounding NAFTA talks is looming large over the Bank of Canada. 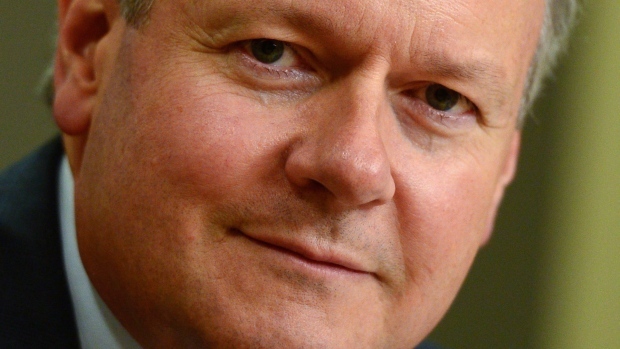 Governor Stephen Poloz held the key lending rate at one per cent on Wednesday, vowing to be "cautious" in making any changes to borrowing costs given uncertainty on several fronts - notably NAFTA. 1. The "notable shift" toward protectionist trade policies is the "most important source of uncertainty" for the Bank of Canada's outlook. It's the renegotiation of NAFTA that takes the spotlight here. The bank isn't forecasting the economic impact of protectionist trade policy, but it does say the uncertainty is "assumed to be hindering Canada's ability to benefit from an improving global outlook." The countervailing duties slapped on Bombardier's CSeries aircraft are also cited as evidence of the "protectionist shift." 2. While Canada's surprisingly strong economic performance raises questions about the need for low, stimulative interest rates, the bank has its eye on record high household debt. The bank is assessing the "sensitivity of the economy" to borrowing costs - among other things - as it makes future rate decisions. "Given higher overall debt levels, [household spending] is expected to be more sensitive to interest rate changes than in previous cycles." 3. The surprising strength in the loonie this summer is putting a bit of a damper on the bank's forecast for exports. The bank says the contribution of exports to economic growth over 2018 and 2019 is "slightly weaker than anticipated in the July Report following the recent appreciation of the Canadian dollar." 4. The economy is operating "close to its potential" and has been cranking out an impressive numbers of jobs, but the bank says you shouldn't expect a big raise any time soon. "Wage gains remain subdued and are likely to increase only gradually," the banks writes in its policy report. Add to that: average hours worked remains low, and long-term unemployment remains "elevated." 5. Canada's rapidly slowing housing market will become a drag on economic growth within the next two years. A host of housing policy measures, including OSFI's new stress tests for uninsured mortgages, are "expected to weigh on housing demand." 6. The two-per-cent inflation target: The bank expects to hit that inflation sweet spot in the second half of 2018 and stay around there for several years.